Fans of the Muppets may be disappointed that the DVDs have no extra features that delve into the history of the famous puppets. In fact, they don’t differ much from earlier video releases of these movies, but at prices starting at $13.99, they are a good value for those who want to revisit these fun films. The first and best of these movies tells the story of how Kermit and his friends got their start in show business. As he tells his nephew at the beginning, it’s “sort of approximately how it happened.” We first meet the young frog playing his banjo in a swamp. A chance encounter with a Hollywood agent on a fishing trip convinces him that he could be a star. 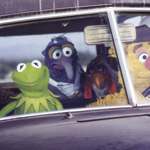 He sets off on a cross-country adventure, meeting new friends Fozzie Bear, The Great Gonzo, Miss Piggy and other odd creatures, while trying to avoid Doc Hopper, who wants Kermit to be a spokesfrog for his chain of frog leg restaurants. Henson and company make many technical leaps beyond The Muppet Show, the most memorable one being the full-body shot of Kermit riding a bicycle. Like the show, which was still on the air at the time, the movie is full endearing bad puns. Many celebrities make brief appearances too. Look for Steve Martin as a snotty waiter (“don’t you want to smell the bottle cap?”) and Orson Welles as the imposing studio head. The Muppets took on new roles in The Great Muppet Caper, which features Kermit and Fozzie as identical twins who are investigative reporters. They and their photographer friend, Gonzo, head to London to learn more about a jewel robbery in the high fashion world. The three settle into a fleabag hotel populated by other Muppets in a set that looks remarkably like the backstage of their television show. This movie aims even higher than its predecessor in tricks with the puppets. 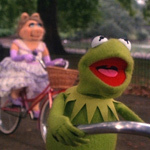 The shot with several Muppets on bicycles is neat, but the thrill of Kermit’s solo bike ride in The Muppet Movie is gone. The many musical numbers don’t advance the story much and feel more like padding for the 95-minute movie. Two big production numbers starring Miss Piggy feature mostly human performers and leave one wondering what they would have been like with more puppets. After the death of Jim Henson in 1990, his fellow Muppeteers carried on. Directed by Jim’s son Brian from a screenplay by longtime Muppet writer, Jerry Juhl, The Muppet Christmas Carol holds its own among the many versions of the classic Charles Dickens novel. As Ebenezer Scrooge, Michael Caine plays against his Muppet co-stars as if they were human actors. 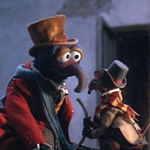 In the role of Dickens, Gonzo narrates the story. Despite the injections of Muppet silliness, this adaptation is surprising faithful to the original story and just as effective. 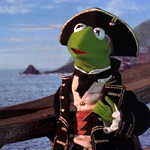 This movie marks Kermit’s move from leading to supporting roles – in this case, Bob Cratchit. Puppeteer Steve Whitmire does a very good job with Kermit’s voice. It’s not the same as Jim Henson’s Kermit voice, but the intonation is right. Even though Kermit still has big roles, it’s a little sad to see him slip further into the background. Taking Kermit’s place at the center of this and future Muppet movies are Gonzo and his sidekick Rizzo the Rat. They actually make a good comedy team, as the menus on the Treasure Island DVD show. The filmmakers turned to another literary classic for the next film. Young Jim Hawkins (played by Kevin Bishop, a human) is working in a pub with Gonzo and Rizzo when he acquires a treasure map from an old sea dog. The three friends head to the Caribbean to seek their fortune amidst pirates, battles, hostile natives and wild boars. With a less serious story than Christmas Carol, the filmmakers let ‘er rip. The result is more spoof than adaptation. The Muppets are sillier than ever. The adult human actors (especially Tim Curry as Long John Silver) ham it up. Gone are the silly puns, replaced with jokes about the NBA, political correctness and pleasure cruises. At times if feels as if the script tries too hard to be wacky, but it’s probably best to just sit back and enjoy the silliness. All four DVDs have a five-minute profile of one of the Muppets by Pepe the Prawn. These are funny as spoofs of celebrity profiles, but are so short that they leave fans wanting more. This is the only extra on three of the four DVDs. Christmas Carol also has commentary by director Brian Henson. His most interesting comments are about the technical aspects of the production. Computer graphics were used sparingly, and the filmmakers relied on other movie magic. About 30 minutes into the movie, Henson starts running out of things to say and the pauses lengthen. What is missing from these DVDs is a look at how these movies are filmed. Many longtime fans would like at least a taste of the Muppets behind the scenes. Also, DVDs that have the “50th anniversary label” ought to have some features about the that fifty-year history. Picture and sound are very good on these DVDs. All four discs offer a choice of watching the movie in widescreen or fullscreen and offer French language tracks.